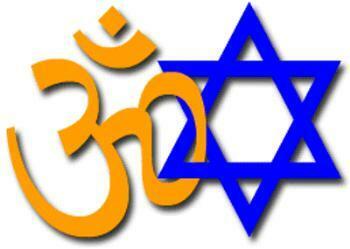 A personal & historical look at Hindu – Jewish relationship, beyond contemporary politics & mutually shared interests. A large number of Hindus admire Israel for its ability to defend itself forthrightly in its neighbourhood, despite being a much smaller country in terms of population and land than its neighbours; it is no secret that the majority of Hindus are generally supportive of Israel’s right to undertake military operations to downgrade the military capacity of terrorist organisations which continuously target Israel. There is also growing cooperation between overseas Jewish and Hindu organisations, with the former often supporting the latter to gain the sophistication which that they have evolved with their much longer and deeper experience of effective lobbying. A few years ago, when I was organising awareness of atrocities against Hindus in Bangladesh, the only non-Hindu group to get into contact to express interest in helping out was a Jewish organisation. Some people have greeted this seemingly new-found Hindu-Jewish affection with scepticism, claiming that the “relationship” is simply based on the philosophy “my enemy’s enemy is my friend” (in reference to the shared struggle against Islamic terrorism), and that this kind of thinking is medieval and dangerous. My own view is that the affinity and cooperation of between Hindus and Jews is natural and to be welcomed; regardless of the fact that our religious traditions are very different. Even before I had the slightest bit of awareness of socio-political issues affecting Hindus and Jews, or of security concerns shared by India and Israel, my personal experiences had shown me that Hindus and Jews share quite similar attitudes, both in terms of aspirations that we hold for our own families and communities, as well as in our attitude towards other communities who live around us. At the age of 10, I moved to a London suburb which at the time was said to have the third highest Jewish population outside of Israel. In my secondary school class (from ages 11 to 16), there were 7 Jewish children out of a class size of 30, and a roughly equal number of Hindu children. Generally the Jews in my neighbourhood kept slightly aloof from others – they are quite insular. But this was never a problem. At school on the other hand, everyone mixed; friend groups always crossed ethnic and cultural barriers at this age. I went to a few “Bar Mitzvahs”; and Jewish friends would attend a few Indian celebrations like Navratri. I felt safe in the area where I lived; the insular nature of the Jewish community, which is of course marked by a theological outlook, historical experiences and also a quest for demographic survival, was never a threat or a problem. They wanted to maintain the distinctness of their community, but did not wish to impose themselves on others. Their attitudes never seemed to pose any sort of threat to others; it is not that they did not want others to prosper flourish and do well, they just wanted their own space to do their own thing. The Hindu communities also share many similar attitudes and overarching concerns. By and large, Hindus also have a live and let live attitude to other communities, but wish to preserve our distinctness. My experience of Jews was that they were quite comfortable with our differences in customs and culture. This was pleasantly contrasted with my experiences living amongst other ethnic or religious groups where “difference anxiety” was palpable.